There's no need to sit around waiting for the "right time" to go fishing for crappie. Now is the right time for catching crappie. You can often expect to find these little scrappy fighters around some distinct locations. When to get out on the water. When all is said and done at the end of the day, the result should be all of us proudly showing off big slabs of crappies that we've caught just like the fisherman in the picture below. First of all, light fishing tackle is required to begin to effectively understand how to catch crappie. My recommendations are ultra light to medium light action rods, in the 6 to 7 foot range. Small capacity spinning reels spooled with 4 to 8 pound fluorocarbon test line shall be all that you need. The desired line weight should be determined by the weight and set up of your lure or live bait. Many anglers believe that the best times to catch crappie are strictly during the cool months of spring, during pre spawn to post spawn, and in the fall, especially in the late evenings and early mornings. These may be some of the hottest times to catch them, however, you can just as well catch many crappie all throughout the entire day all year round. Crappie tend to roam into deeper waters of the hot dog days of summer and the colder months of winter. Why? They search for cooler water temperatures in the winter, and prefer to shield themselves and their sensitive eyes from the glaring sun light during the summer. Another important aspect to be aware of when figuring how to catch crappie is that their eye site becomes extremely superb in colder water temperatures. Therefore, you should choose your rigs and presentations wisely to meet those standards. As the sun sets in the evening, especially during the warm days of summer, crappie will naturally start to migrate up into shallower water. They will usually vicinitate the shallows from then, and throughout the night, and as the sun begins to rise in the early morning. If you are fishing from the bank, concentrate more on smaller bodies of water. This can be shallow or short width ponds, or thinner sections of streams, rivers and creek channels. Move along the bank and focus on key types of structure such as weed lines or brush piles. 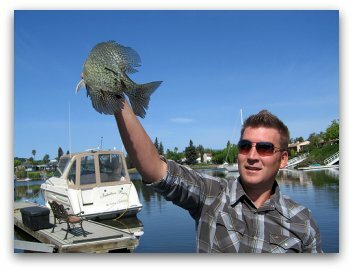 It's a bit easier to figure out how to catch crappie from a boat in larger freshwater impoundments. A boat will allow the fisherman to get to and follow the big schools of crappie. Use a map or your sonar electronics to look for points, underwater brush, weed lines, ledges, boulders, isolated humps and islands. Crappie will often be found schooled up around these areas. Maneuver around to locate docks, bridge pilings, fallen trees or other structure that may not otherwise be noted on your maps. Try to concentrate more on the crappie that you can see higher up in the water column. The fish that are suspended higher up will be more active than the crappies nestled further below. Cast your jig or bait out to the determined depth, let it set or twitch and retrieve it until you have figured out how they want it. Using a float is a very effective method for putting the bait or the lure at your chosen depth. The fish aren't going to try chasing down the bait so you need to get the bait right up into them so they can see it. Adjust the bobber as needed to the correct depth until they start hitting. Swiftly set the hook when you see the slightest movement from the float. Crappie can be very color selective, perhaps more so than any other species of fish. So, switch out and experiment with a variety of colored jigs throughout the day. A good rule of thumb I often go by is that to use darker colors in deeper and stained water, and to use lighter and more realistic colors higher up in the water column and in clearer water. If in doubt, you almost can't go wrong with using some live crappie bait. And I have had an equal amount of success with both. These are a few of the most important aspects to be aware of to efficiently know how to catch crappie at any given time and consistently throughout the year. Remember, the first thing you need to do is to locate the fish, and the information above will help guide you to have much success as long as you apply it. Once you catch a crappie or two in one location, then you most likely have found a school of them. Take notice of how you caught the first couple and repeat those same techniques. Before you know it, you should have limited out with a ice chest full of nice tasty crappie. 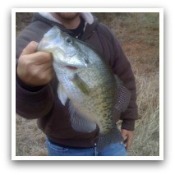 Click here to see more crappie fishing tips. Share Your Crappie Pictures and Stories Here.